When you need more than manual therapy for a herniated or bulging disc, we offer IDD Therapy. As specialists in helping back pain sufferers, we see patients who need something more than hands-on therapy. If you have had back pain, neck pain or nerve pain for some time, particularly if you have a disc problem, then our IDD Therapy treatment programme is here to help you. IDD stands for Intervertebral Differential Dynamics (IDD) Therapy, or more simply IDD Therapy for short. Developed in the USA in the late 1990s, IDD Therapy is a targeted treatment which relieves pressure on specific spinal discs and gently restores mobility. 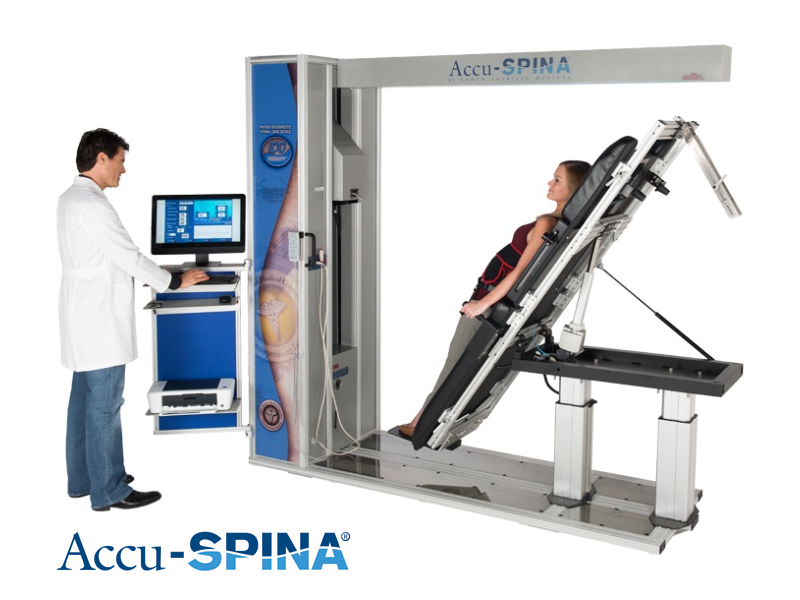 We have an IDD Therapy machine (Accu-SPINA), which patients lie on as part of the treatment. It is computer controlled and perfectly comfortable. By decompressing (taking pressure off) an injured or bulging/herniated disc and stretching the soft tissues, we can improve mobility in the spine with the goal of allowing the body’s natural healing mechanisms to operate more efficiently. In so doing, we aim to relieve pain caused by muscle spasm and alleviate nerve compression and irritation caused by bulging discs. As clinicians, we can treat most back and neck pain with manual therapies but for some conditions – particularly those that are disc-related – patients need something more to help their condition to improve. Typical candidates for IDD Therapy are people who have back or neck pain and may have tried various other treatments without success. They may be taking pain medication and may be considering invasive treatments such as injections or in extreme cases, surgery. “Osteopaths, like other manual therapists, help to resolve back pain issues on a daily basis. And yet there is a group of patients who just don’t get to a point of making progress. Typically we refer these patients on for pain management, which is incredibly frustrating when really, our goal is to get people out of pain. If you live in and around Buxton and Derbyshire, have a back pain or neck pain problem, or symptoms in your legs or arms, then come for a second opinion from us and see how we can help you. If you are suitable, then we can take you through your options for treatment. Each IDD treatment lasts for one hour. Sessions begin with 10 minutes of heat therapy, using a TherMedic belt, to warm the tissues and get blood flow into the injured area. You then have IDD Therapy, which lasts for 25 minutes, on the SPINA machine. Afterwards we give you 10 minutes of cold therapy. This is just to calm the treated area before you go home. You remain comfortable throughout. Each session lasts for one hour and is billed as a one hour osteopathy treatment. The price is £65-£70 which is in line with standard treatment charges. This is an important question and one which the team will discuss with you. It really does depend on the duration and severity of your condition. People with mild back pain may experience symptomatic relief within a few sessions, but for long term problems, most patients will need a course of treatment. A typical course will be 10 sessions over a 4 to 5 week period. For patients with serious spine issues who are facing surgery, the original protocol is based around an intensive course of 20 treatments. There is no such thing as a cure all for back pain, of course. If for any reason you are not responding to the treatment in the way that we would like, then we will advise you accordingly and stop the treatment. Why do I need a course of treatments? When patients have had back pain or neck pain for some time, their spinal segments become stiff and immobile. The discs in the spine rely on movement for their hydration and nutrition. To undo the compression and immobility of an injured disc, IDD Therapy uses computer-controlled pulling forces to open the spinal segment and then mobilise it. To do this we have to use comparatively higher forces than can be achieved with manual therapy. And we need to progressively increase the pulling forces to achieve the goals. So, rather in the way that exercising requires more than one session for the body to adapt and become fitter/stronger, addressing the causes of back pain means that the body has to gently adapt to treatment. This simply cannot be achieved overnight or in just a couple of sessions, hence the requirement for a course of treatment. We would all like a simple solution but the reality is that improving chronic back pain takes time. Should I bring an MRI? If you have an MRI, bring it with you. The MRI helps us to confirm the spinal level that we wish to treat and also the nature of the disc problem. This will help us to get a picture of the protocol that will give us the best chance for success. If you don’t have an MRI, we can discuss this with you and arrange one where appropriate. No, you remain fully clothed throughout. You can wear normal clothes, so long as they are comfortable. Ladies should wear trousers, leggings or a loose-fitting tracksuit. No. The treatment is intended to be comfortable. Whilst considerable pulling forces are used, they are delivered in such a way that the body is comfortable. Much better than the traction machines of old. Many patients go to sleep because the treatment is so relaxing. A by-product of treatment is the release of endorphins, so treatment feels good. Yes. The treatment is safe, with many patients going to sleep during their session. The treatment progresses gently with the added reassurance that if at any time a patient does feel uncomfortable, they can press a treatment stop button. In such a case, the treatment stops smoothly. Why does the bed tilt upright? When IDD Therapy was developed, part of the design was to resolve problems associated with traditional traction (a mechanical treatment). 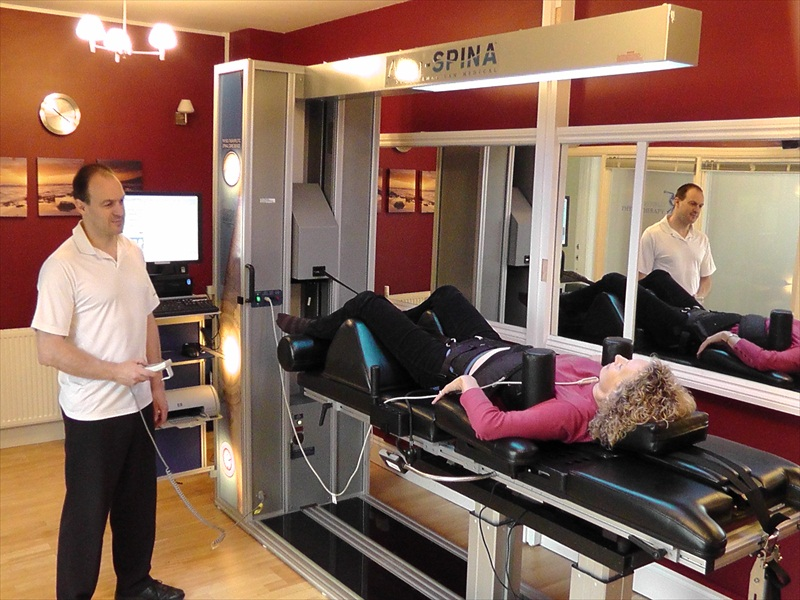 The patient steps on to the bed in an upright position without having to twist (and put pressure on the disc). However, the main purpose of the bed tilt is for when patients have finished treatment. After the controlled treatment, the patient is brought upright slowly and gently so that they return to weight bearing progressively, without any twisting movements. We will give you guidance as to what exercise is suitable. Initially, we don’t want you to exercise because the body is getting used to the treatment, then there will be some simple exercises. Nothing too strenuous – and we don’t just send you on your way with a sheet of exercises! Will a spinal injection help my pain? Spinal injections are given to help ease inflammation, which is a cause of pain. They are intended to create a window for rehabilitation. An injection is not intended to address the problems of compression of discs or stiffness in the spine. Spinal injections are not a long-term solution for most patients. I have had surgery, can I still have IDD Therapy? Patients who have had surgery can opt for IDD Therapy. The two criteria are that the surgery was carried out six months ago and that there are no implants in the spine. Talk to the team if you would like to discuss your spinal history. How may treatments have been carried out in the UK? In the past 5 years over 37,000 treatments have been carried out in the UK alone and IDD Therapy is the first choice non-invasive disc treatment when manual therapy is not working, in areas where it is available. There are over 1,000 clinics internationally providing IDD Therapy, including surgeons, physiotherapists, osteopaths and chiropractors. Make an appointment to see Phil Heler. He will assess your condition and give you a good understanding of whether IDD Therapy is suitable for you. IDD Therapy treatment is just one treatment tool that we use, and as part of your assessment we will advise you on the most applicable treatment for your individual needs.